The Red Devil® Tuf-Kut Auto-Loading Utility Knife combines fast action, safe blade changing with a heavy duty ergonomic design. It's designed with an EZ Gripâ„¢ handle for a comfortable ergonomic grip providing greater control and reducing operator fatigue. The unique Knife Magazine holds 10 standard 2-notch utility blades and the auto-load feature allows fast blade change with no extra tools required. It has a heavy duty, die cast body for increased durability, balance and control. Blade retracts for operator safety. 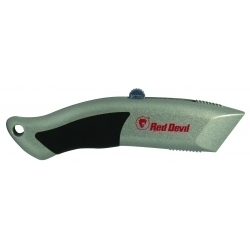 Red Devil® Utility Knife Replacement Blades that fit Red Devil and most other standard utility knives.